We’re just tickled to get to introduce y’all to a new set of Blue Ribbon Vendors, because we know any one of them would be a joy to you if you choose to work together! We’re using a few of our favorite BRV interview questions to help you get to know these lovely ladies and gents. Click through to their listings to find out more about them!! Favorite part of a wedding day? The moment just after a couple is pronounced husband and wife. It never fails, every single couple gives the biggest smiles and joy radiates from them! 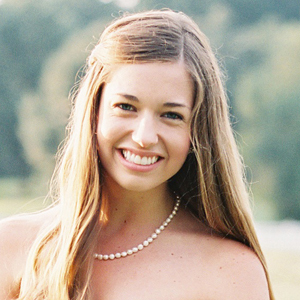 Name: Kelly Parker Smith of Hello World Paper Co. Favorite part of a wedding day? The cake! White on white cakes with simple details are my absolute favorite! How I got into weddings: I have always been drawn to creating beauty in whatever craft or project I decided to take on. The wedding industry is ultimately about creating beauty and joy that will be cherished in memories forever, so it was a natural fit to find myself working here. I am blessed to work with clients every day who want beautiful details to add to their big day, and it’s an honor to be able to provide that for them. I truly love it! Favorite thing about weddings in the South? The hospitality! I love weddings where everyone is treated like family. It is really special to see two families become one. Best piece of advice you can give to brides and grooms? Laugh as much as possible. How I got into weddings: My best friend’s sister got married early on in my career and was asked to do the bridesmaid dresses. After saying no a number of times, I was finally convinced and the rest is history! My first wedding took place in a barn in the mountains of NC. The dresses were a beautiful persimmon orange. It was a great way to get my start in the bridesmaid world! Favorite part of a wedding day? The moment the doors open and the bride walks down the aisle is always so special. We dare you to say you’ve never shed a tear at that moment! Favorite thing about weddings in the South? All of the thoughtful details that go into the planning. And lots of flowers and lots of dressed up people! Best piece of advice you can give to brides and grooms? Always forgive. Try not to mess up big, but if you do, remember that we are all just people. Favorite part of a wedding day? Bride and groom portraits, when they have a bit of time to themselves and I get the opportunity to document their natural excitement! Check out all of our favorite vendors in the Blue Ribbon Vendor Directory! I also want to mention that we’re working particularly hard to expand some of our areas of slim pickings–namely Arkansas, Mississippi, Oklahoma, and West Virginia. If you would like to recommend someone (or nominate yourself!) for any of these states, please email kristin at southernweddings.com!